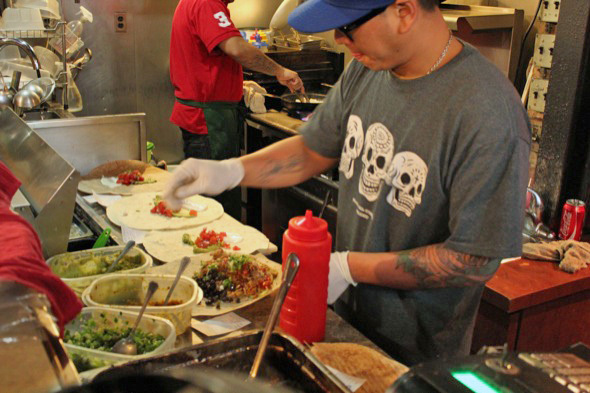 Chino Locos is not your average burrito bar. 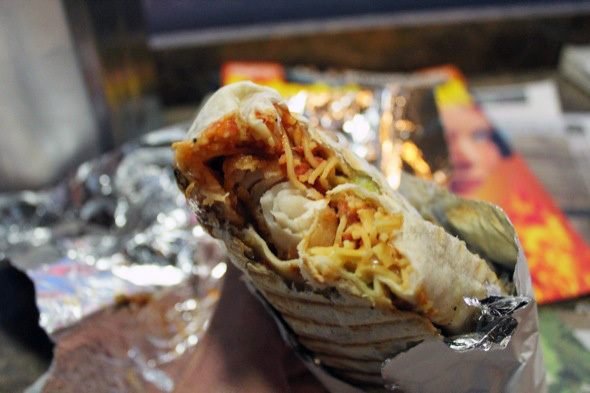 In appearance, it may fit the profile; a minuscule space, slammed with starving customers waiting to wolf down tightly packed tortillas crammed with protein and produce. The unconventional aspect of this local gem is the distinctly curated list of fillers that may find their way into your wrap, like edamame beans, shitake mushrooms and the texturally different though superbly tasty option of chow mein noodles instead of rustic rice. I got a chance to chat with co-founder and the man-of-the-house around their Greenwood location, Minh La, about how he and his partner and childhood friend, Victor Su (find him at the Church St. shop ) came up with such wildly unique and delicious preparations. "It was a pure trial and error," La remarks. "We both come from Chinese and Vietnamese backgrounds so we thought about integrating our favorite Asian foods into the fold along with traditional Tex Mex ingredients." Anticipation grows as one stands among other hungry patrons, saturated with mouth-watering aromas of roasted pork, smoky chilies and the unique assembly of freshly prepared ingredients. 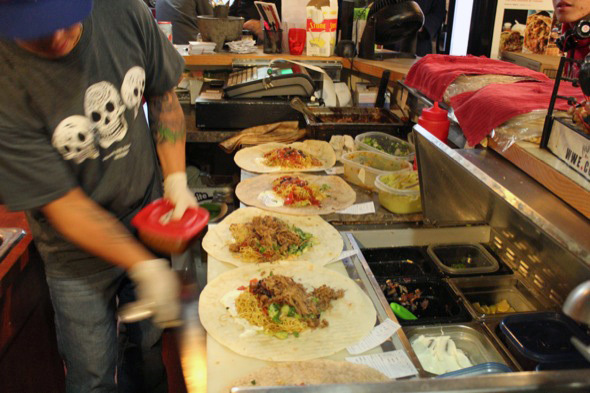 Pre-ordering is preferred by the seasoned vet as the cap clad crew at Chino Locos turn out hundreds of burritos a day to locals and loyalists alike. 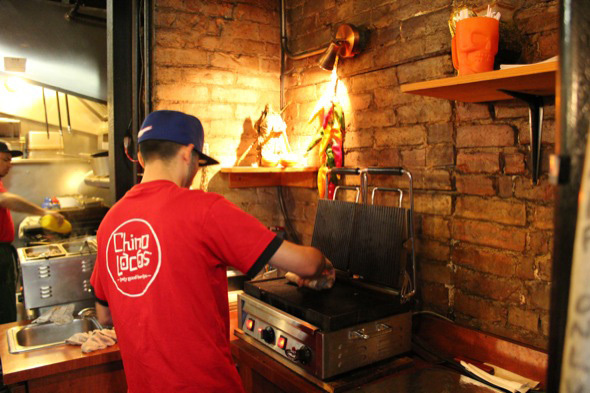 If you're phoning in your order, make sure to ask about their weekly Loco special which have included things such as General Tao chicken, jerk pork, Korean beef or this week's special Adobo chicken ($8.99). All their standard burritos are priced at $6.99 plus tax except for the Juicy Vegan ($7.99) and the weekly special. For the carb-contrary, you can also get your burrito in a Bento Box; hold the tortilla shell. Upon recommendation I rolled with the one they call 'Da Finest' Fish Burrito (fitting given my namesake) consisting of sautéed white basa fish, guacamole, tomatoes, edamame beans, red onions, black beans, green peppers, cilantro, cheese, sour cream and chipotle sauce, if you opt for the fully loaded option plus choice of rice or chow mein noodles and spice level. The fresh, tender pieces of basa are marinated and sautéed on the spot and the flavour truly shines. The flakiness of the fish and soft texture along with the noodles were a great contrast to the crunch of the green pepper and onion. I'm a total spice addict and "super spicy" request was met with heeded warnings from the staff. House made and damn hot, these boys know how to make a proper chili sauce! A mélange of 7 different chili peppers and spices such as habanero, Thai and Vietnamese chilis and long banana peppers, to name a few. Fresh and made-to-order seemed to be the prevailing theme around the joint, and I heard it over and over again. "You may end up waiting a few extra minutes to get your fix," Na said, "but that's just how we roll!" Pun intended? 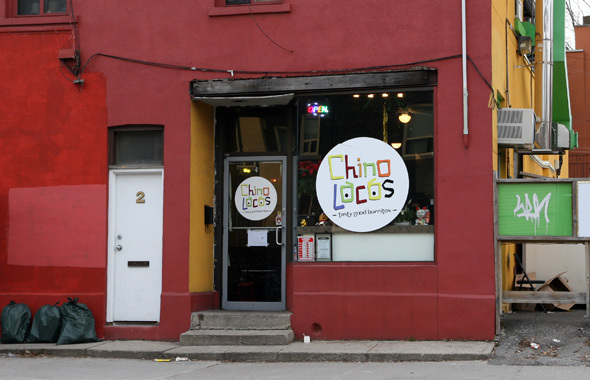 I don't often find myself if that neighbourhood, but I'm a man who likes his burritos and can confidently say that the next time I'm rolling by, I wouldn't be surprised if my palate pulled me towards Chino Locos like it did today.